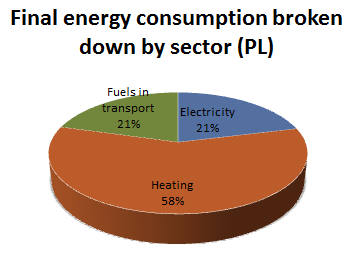 Heating and Cooling is, with 58% of the final energy demand, the largest energy sector in Poland. More than 50% of citizens are connected to district heating, which is largely supplied by coal. Biomass is basically the only renewable energy source developed in the country, covering as little as 6% of the heat supplied by district heating. 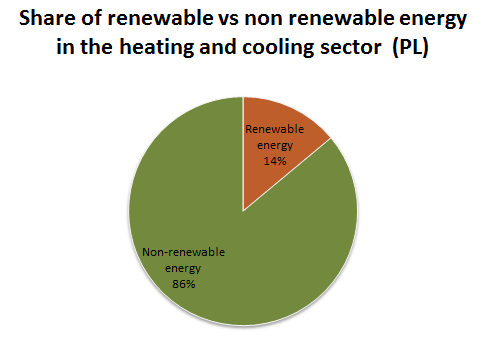 Overall, renewable energy sources cover 14% of the heat demand. In terms of support schemes, EU Structural and Investment Funds are used to provide grants and low interests loans to support the purchase and installation of renewable heat technologies.